A walk down the memory lane – Me, Myself and My Blog. It was end of 2003 when I moved from the Office Developer Team to the Visual Studio for Devices Team. A team that was chartered to provide developer tools for Windows CE and Windows Mobile. Quite a change from writing code in Visual Basic/VBA to C++ for Smart Devices and even more interesting was having to grasp a dozen new code words ‘Cedar’, ‘Talisker’, ‘Ozone’,’Jameson’,’ McKendrik’ in the first week of starting. eVC also came with the support for the Standard CE Emulator which was an X86 based emulator for helping debug the application. 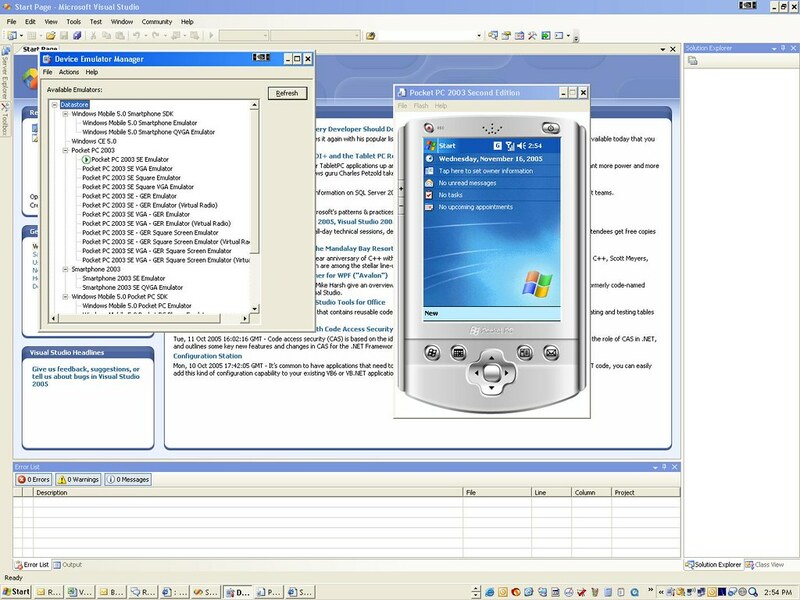 While many developers were writing hardcode native applications, a part of my team was also working to enable ‘Winforms’ support on Windows Mobile and CE using Compact Framework. Our first incarnation of the managed tooling for Visual Studio was called as the ‘Smart Device Extensions’. A name that stuck on for years even after we become an integral part of the Visual Studio .NET 2003 product. An interesting introductory article from Jim Wilson (One of our MVPs) around this technology published almost 8 years ago. So at this point we had 2 development tools, eVC for Native Development and Visual Studio .NET 2003 for doing Managed Development. I guess we knew what was coming next. Visual Studio 2005 was the first IDE that now supported both Managed and Native Development. Here was my first article on the new features in VS 2005.
and this was one of the richest IDE we did so far. very cool design time experiene - WYSIWYG for both Pocket PC and Smartphone. And how could we not give you high fidelity emulator. Barry Bond from my team was working a very high fidelity emulator (internally we called it “Barry’s Emulator”). It was an ARM based emulator to provide high fidelity for Native Apps and very powerful simulation for Managed Applications. Fast forward another 2 years, and Visual Studio 2008 was around the corner. With a huge spike in the adoption of our tools and growth in developers using our the tools, we put a lot more focus on the developer productivity. Unit testing support was added as one of the core enhancements. So now, what’s next ? Well all I can say is Stay tuned. The exciting stuff is only a few days away ! Come meet me and MIX and we would love to talk about it ! Also follow the blogs of Charlie and Christian to learn more about Windows Phone Development. 03.15.2010 – I am waiting for MIX, I hope you are too ! PS:Pictures are from various articles I wrote and/or MSDN articles on Smart Devices across the years.